Heat oven to 450°F. Line 15x10x1-inch pan with cooking parchment paper. Unroll pie crust in pan. In large bowl, toss apples, brown sugar, flour, ginger and cinnamon. Spoon apple mixture onto center of crust, leaving 2-inch border (apples will be piled about 4 inches high). Sprinkle butter over apples. Fold edge of crust over, pleating to fit. Brush crust edge with water; sprinkle with granulated sugar. Loosely cover top and sides with foil; bake 20 minutes. 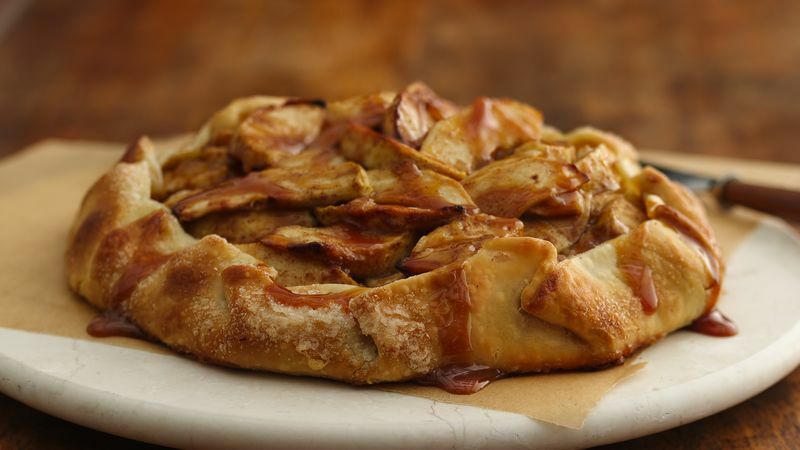 Remove foil; bake 9 to 13 minutes longer or until crust is golden brown and apples are tender. Immediately run spatula or pancake turner under crust to loosen. Cool 30 minutes before serving. Cut into wedges; drizzle with caramel topping. Shop for crystallized ginger in the spice section of the supermarket. Choose a crisp baking apple such as Haralson, Honeycrisp or Braeburn.